I recently returned from my first trip to GenCon, July 30-August 2, 2015, held in Indianapolis, Indiana. GenCon is named after Lake Geneva, Wisconsin, where the convention first began, but when it outgrew its space (again, and again) it moved a number of times until it ended up in its current home in Indianapolis in 2003. GenCon has been held at the Indianapolis Convention Center ever since. GenCon began as a celebration of Dungeons & Dragons, but over the decades it has evolved to include every type of gaming imaginable, from roleplaying, to LARPS, to tabletop games and video games. There are also many related elements, such as costume-making, music, weaponcraft, films, writing, and dancing. If you play games of any sort, then GenCon has a place for you. Although this is a convention centered around gaming, we did not want to attend and just sit at a table playing games. We can do that at home! We were traveling more than halfway across the country to attend, and as such, we were interested in things that were new to us, especially things in which we could not participate anywhere else. And with this in mind, we found ourselves with a full schedule. Some of the many events in which we participated were live stage shows, a roleplaying tournament, various seminars, a number of LARPS, and live-action dungeoneering. This was in addition to the very full exhibit hall, packed with captivating merchandise and game demos of every kind. One of the best events we attended was the Gamers: Live show. This is put on every year by Zombie Orpheus, an independent Seattle film studio that focuses on gaming and fantasy webseries. Their actors hold an improv roleplaying game session, where the audience helps create the adventure, and even participates onstage as NPCs. We also loved Killer Breakfast, where Tracy Hickman (author of D&D modules and many fantasy novels) creates an adventure designed to kill as many players as possible… and then invites the audience to be those players! My husband’s highlight was participating in a Battlestar Galactica LARP in full costume, while I enjoyed participating in a NASCRAG (NAtional Society of CRAzed Gamers) roleplaying tournament, where our pickup team unexpectedly performed exceedingly well, even making it to the final round. One thing we all enjoyed was participating in True Dungeon, an event where they build an actual dungeon, populating it with puzzles and monsters, while you enact the role of an adventurer moving through its dangerous encounters. It was also fun to attend Wil Wheaton’s Titansgrave seminar, where he discussed his new roleplaying webseries (companion to his Tabletop series). We were so busy that I had to pass over opportunities to attend seminars on painting miniatures, creating chainmail and other cosplay elements, and game design, as well as a number of writing seminars (GenCon has a terrific set of writing panels put on by published authors, similar to the Writer’s Block at Emerald City Comic Con). I did make an effort to set aside some time on Sunday morning to attend a ‘read and critique’ panel, where people currently publishing and editing in the industry gave constructive criticism as I read them excerpts from my own writing. I found this to be extremely valuable, and have never seen this kind of opportunity available at other cons. It was kind of like a ‘comic portfolio review’, but for potential writers. As an educator, I was also able to attend Trade Day, which is held the day before GenCon officially begins. Trade Day is open to educators, librarians and retailers, and consists of a number of seminars relating to using games in educational environments, as well as describing upcoming game releases. I attended sessions that gave me some great ideas for my own students, and socialized with other educators, engaging in a kind of creative exchange that is rare in my field. That evening, we all attended a number of game demos in a relaxed environment, trying out some fun new games and interacting with the game designers. While obviously GenCon’s focus is much more gaming-oriented than a con such as SDCC, there are also other differences in terms of the attendee experience. 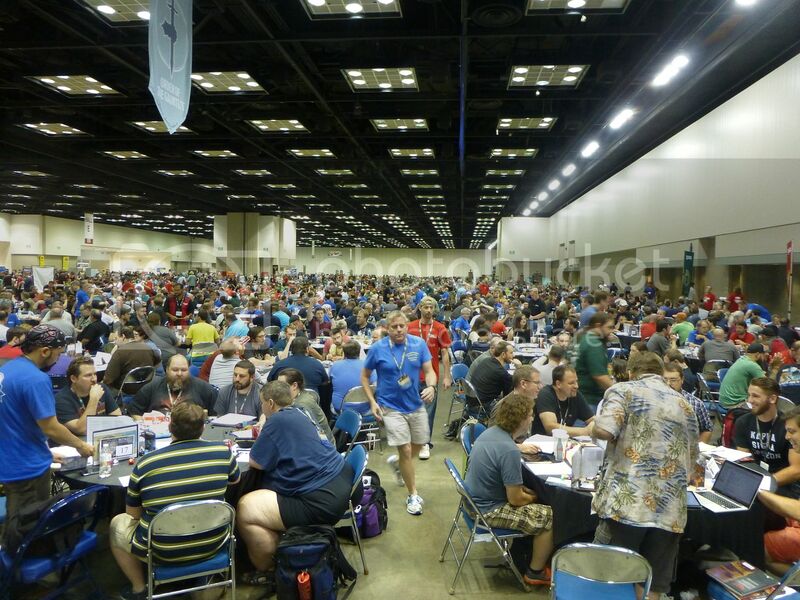 One of the biggest differences is that nearly all GenCon events are ticketed. This means that approximately 2 months before the con, you have to book all of the events that you wish to attend. While this is done online (and can be somewhat cut-throat, particularly for popular, low-capacity gaming events) the advantage is that at GenCon people spend very little time in lines. You know exactly what you are doing well in advance, which makes it easy to plan your schedule. If something is full when you go to book your ticket for an event, you can then book something else, so you never have to criss-cross the convention center looking for your ‘backup choice’. You will know in advance exactly what you are doing. The disadvantage to this ticketing system is that most events have a fee above and beyond the cost of the GenCon badge itself. This year, a pre-registered 4 day badge was $80, but most event tickets cost $2 to $10. Some events are free to attend, while others can be quite expensive (True Dungeon topping the list at $52 per person per session). Our group of 4 people easily spent about $1,000 on event tickets and badges. However, this breaks down to about $250 per person, which is on par with the $220 for a 4 day + Preview Night badge for this year’s SDCC. So while it may seem shocking at first, overall the badge/event costs are similar. Hotels in the discounted block are just as difficult to obtain for GenCon as for SDCC, but booking outside the block is much easier. The cost of hotels is approximately $100-$150 less per night, with downtown hotels in the con block running at about $200-$250 per night, and booking downtown rooms out of the con block running at about $350-$400 per night. In San Diego, many SDCC attendees like to go out into the Gaslamp for dinner, drinks and parties. At GenCon, there are many restaurants in the downtown area, within close walking distance of the convention center, that cater to gamers during the con. In addition, Indianapolis closes off two large blocks right next to the convention center and fills them with food trucks, making it easy for attendees to hop outside and catch a quick bite to eat. This is something that would be much appreciated at SDCC, but is unfortunately not possible due to traffic patterns (both for vehicles and attendee lineups). 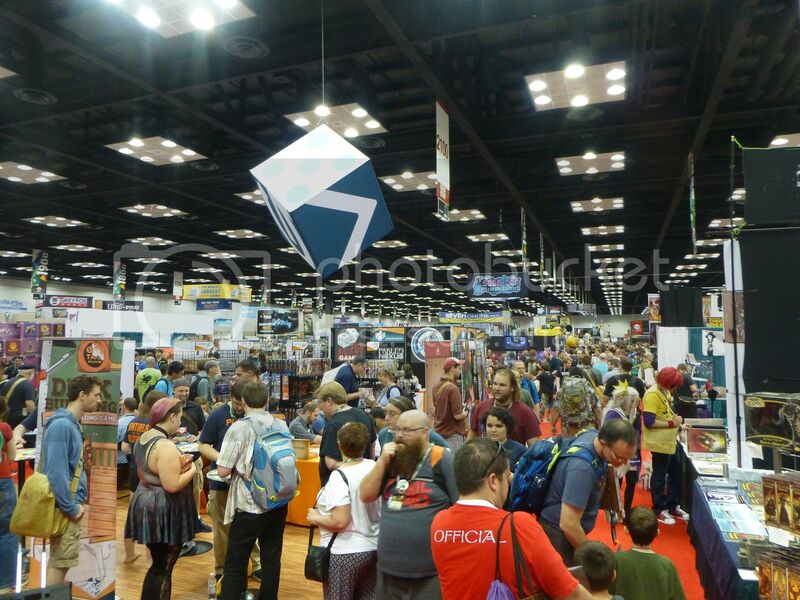 GenCon is about half the size of SDCC (attendance was estimated at approximately 61,000 for 2015’s show) but given the smaller convention center and more limited ‘offsites’, it runs in about half the space, so it has the same ‘crowd’ feel as SDCC. If you’re interested in GenCon and thinking that it might be for you, I encourage you to watch this video (put out by the city of Indianapolis, which really rolls out the red carpet for GenCon attendees) to get a flavor for the event. Who knows, maybe next year I’ll see you at GenCon 2016!